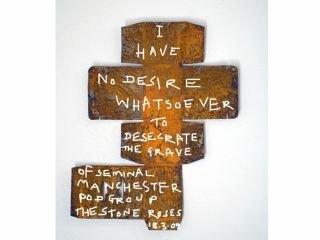 Former Stone Roses guitarist John Squire is set to auction off a piece of artwork called Statement on 1 July at Christie's Auction House in London. Squire created the piece of art in March as his way of putting the kibosh on rumors that he would be taking part in a Stone Roses reunion. Oddly enough (intentional? ), this Statement almost looks like a grave marker. The Stone Roses famously split up in 1996. If you're interested in placing a bid on Squire's Statement, go to Christie's.com for more information.